Just going slightly off topic here but you gotta read this article a friend of mine wrote about food bloggers! 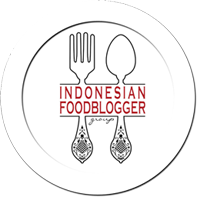 It's in Indonesian though, since it's concerning food bloggers in Indonesia and Indonesian's view on food bloggers. Well, moving on! Calling to all burger fans, we'd like to share about this cool place that is very close to our home, which is amazing cause we need more interesting dining spots here in West Jakarta! 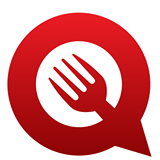 Just looking at the logo on top of the burger below should definitely give the name away almost immediately, right? If you know this place then you'll know what I'm talking about. Yeap, it's Burgerous! Located at Taman Ratu, I had been watching this place (sounds stalker-ish, huh?) ever since they've finish the interior, just before opening cause there're not many restaurants with interesting interiors in the area, so they stand out like sore thumb! I do apologize beforehand for the lack of interior but it's all about the food, right? Don't you just love the colorfulness? For me, the banana colada is a bit too sweet and heavy, whereas the taro was 'not taro enough', however, the lemon coke is definitely the perfect choice, nothing is better than coke and burger! What I want to highlight is their durian iced tea, not only because you won't find it anywhere else but also tastes good for people who likes durian! Totally not recommending it for those who's not a fan cause the durian taste and smell is really strong! Straight cut fries, always freshly fried and seasoned with 7 herbs and spices. I'd say they're really good, just that, I don't know if we're just unlucky or something, but there's a slightly sour taste in some of the fries. Anyway, you only need to add another IDR 15K onto the burger a la carte to make it a combo with fries and iced tea on a medium size or IDR 18K for large! Another thing, the dipping sauce costs IDR 5K each, the choices are (from left to right) mixed berries, aioli, pepper chipotle, calypso, honey mustard and lastly, cheese (not in the photo). I'd recommend the pepper chipotle and calypso! Creamy mashed potatoes made from real potatoes, painstakingly boiled and mashed. Layered with beef bacon bits and covered in our homemade brown sauce. Our Australian beef patty layered with homemade BBQ sauce, paired with mixed veggies on top of buttered rice. My favorite dish here! Fragrant butter rice combined with tender patty and flavorful mixed veggies, plus don't get me started on the beautiful BBQ sauce! Everything in this paper plate is simply wonderful! If you're looking for a quick fill, I'd definitely ushered you to order this! A Dory fish patty, breaded with our secret ingredients, and deep fried. Topped with homemade Hollandaise sauce, in between a toasted bun with fresh lettuce. Let's start off with the normal type burger and gradually getting to the more unusual ones! This one is a more familiar one that you might also at fast food burger shop but as you can see the Dory patty is an actual fried Dory instead of a square shaped fish patty. Crispy and light with a yummy Hollandaise, buns might not be chewy enough but I guess that's just preference! A thick beef patty filled with melted cheddar cheese within, along with fresh lettuce and toasted bun. It's getting more unusual now, cause this one has a cheese filled patty! Yeap, you read it right! It's cheese INSIDE the patty and not just any cheese, melted cheddar cheese! Can you just imagine the beautiful cheese that just melts to your mouth in a bite? The only bad news is that because the patty is pretty big, I find it hard to fit all buns and patty in 1 bite..well, it's more of a problem to the girls, I guess? Deep fried burger bun with a tinge of sweetness, paired with a beef patty, a slice of cheddar cheese, our secret sauce and fresh lettuce. Now that we've seen an unusual patty, it's time for the buns! For this one, they deep fried the buns and added a sprinkle of icing sugar, so it's crispier with a hint of sweetness. The patty might not be filled with melted cheddar cheese but you can see from the photo that they also used cheddar cheese on top of the patty for this one, melted as well! This was my favorite one out of all the burgers I've tried! A deep fried chicken fillet, layered with our homemade Fiery sauce, the spiciest sauce on our menu, along with lettuce and toasted bun. Lastly, it's not about the buns or the patty but this one is all about the sauce! They used rica-rica for the sauce, which is one of Manado's spicy sauce and they weren't kidding about the spiciest sauce on the menu cause even though I didn't try all of their menus, I really believe that this is the spiciest! Be warned, everybody!! White bread filled with Kaya and Peanut Butter, soaked in our homemade eggy batter and then panfried. Topped with maple syrup and sugar icing, along with a scoop of our unique Kopyor ice cream. Not forgetting about my beloved desserts, we went with this french toast and ice cream, since they only have 2 choices of desserts and that's this and ice cream. Seeing as this one also has ice cream included, there's no doubt I'd choose this! It might be a bit too sweet if you're not a sweet-tooth but I love how rich it is and the Kopyor ice cream is totally a good twist! Yum! Loving how every burger bun has their logo imprinted on the top! I do think they're a bit pricey, since they're located at an area where people expect affordable foods, it'll be more suitable to the target market if they're in the South. (Wow, I'm talking about target markets, the thesis pressure is definitely getting to me!) Still, I'm really glad that there're more and more cool places opening on the West and even more glad, since it's close to home!